This Shadowrift 2nd Edition review is based on seven games played. We haven’t played a six-player game yet, but we’ve tested it out at every other player count. 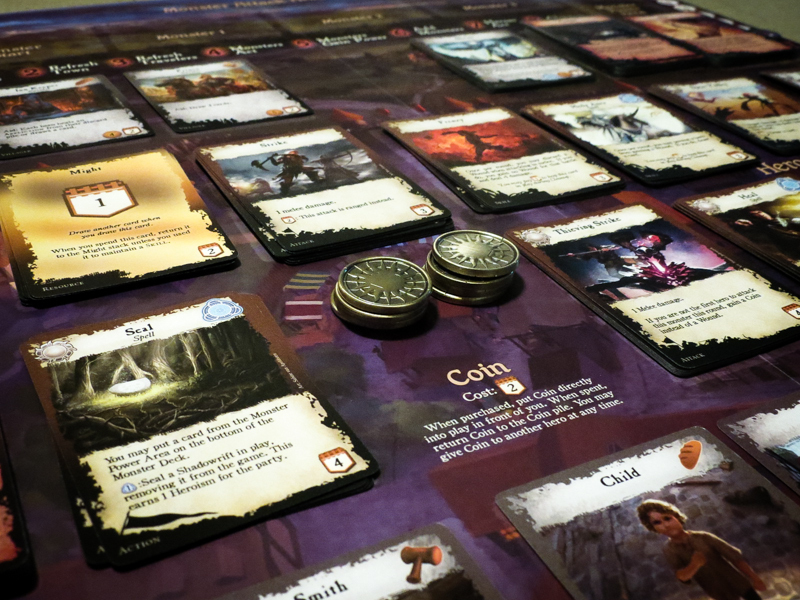 Shadowrift is a cooperative deck building game in which you’re attempting to fight off a horde of monsters that are trying to attack the town of New Haven. You’ll do so by building a deck of hero cards and getting some help from local villagers. 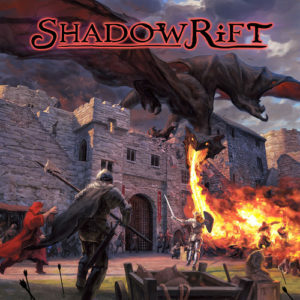 Shadowrift was designed by Jeremy Anderson and published by Game Salute. At the beginning of each game of Shadowrift, you’ll need to choose a monster faction to go up against. After that, you set up all of the decks on the board and you’re ready to go! Unlike other deck building games, in Shadowrift you do not have a unique hero that you are building up throughout the game. Instead, you start out with the same basic cards and you have to choose who your hero is by adding cards to your deck. You can focus on spells, attacking, healing, or even going for a balanced mix of all three. When the heroes take their turns, they do so in any order they choose. You could buy a coin, allowing another player to use it, then take another action if you want to. You can’t combine resources to buy cards, but you can time how you take actions to get the most out of each turn. There are three resources in Shadowrift: Prowess, Magic, and Coins. Prowess is the most basic resource and can be used to purchase cards or even to keep some of your cards in play during the Cleanup phase. Magic is found on your spell cards and can be used to purchase cards or to activate some cards’ special abilities. Coins can be purchased in town and are used to buy some of the best cards in the game. Heroism cards, which are gained when you defeat monsters, are the wild cards in the game. You can use a Heroism card as Prowess, Magic, or as a Coin. The first Heroism card goes to the player who slays the first monster, but it is then spread out evenly by passing the Next Heroism token around the table as you kill monsters. There are four types of Hero Cards that you can add to your deck: Loot, Attacks, Skills, and Actions. Loot cards, unlike most other cards, do not go into your discard pile at the end of your turn and continue to give you abilities throughout the game. Attacks help you to take down the monsters. 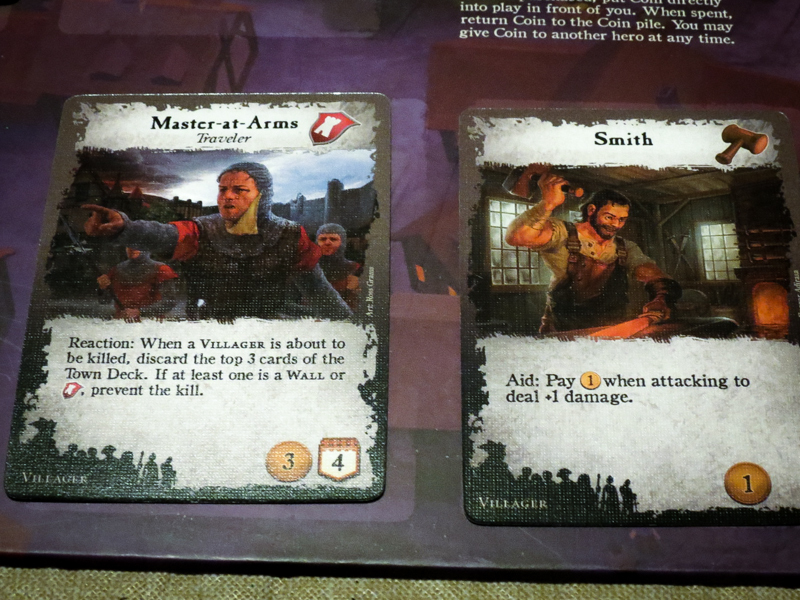 Skill cards are similar to Loot cards, but you will need to pay one Prowess to keep them in play each round. Action cards give you a variety of ways to boost other cards and to help out your teammates. During each round, five villagers will join you in town and will try to help your team of heroes. They can give you additional resources and discounts on purchases, and they can even keep other villagers alive. Throughout the game travelers will come through town and you can add them to your Town deck by spending resources. Sometimes travelers are infiltrators who immediately go into your Town deck’s discard pile, slowing down your team’s progress. There are eight Wall cards that you can purchase and add to your Town deck. These cards help to keep New Haven safe by stopping some monster actions. Also, if you’re able to build all eight Walls, you win! Monsters come into town when their power level has been reached. The power level is determined by how many players there are and how many monsters have been able to pass through town. For example, if one monster with a power of three has made it to the Monster Power Area and you’re playing with four players, the power level will be raised to seven during that phase of the round. There are some cards, called Power cards, that go directly into the Monster Power Area, giving the monsters a great advantage if you can’t get rid of them. As a monster moves through town, it will take actions based on the space it’s moved to. They begin in the Monster Start area, then move through three spaces before going to the Monster Power Area. In most cases, the actions they take get worse and worse as they move through those spaces. They can give players wounds, which clog up their decks, and they can quickly kill off villagers. Within the monster deck are a number of Shadowrift cards based on the number of players. The Shadowrifts add one point of power to the Monster Power Area, and you will need to use Seal cards and Magic to close them. If you’re able to seal all of the Shadowrifts, your team wins! Your team’s goal is to either seal the Shadowrifts or build all eight walls. However, you’ll lose if you’ve had to use all of the Corpse cards (the cards that replace slain villagers), if there are no villagers or walls in town at the start of the heroes’ turn, or if a monster uses the Annihilation ability to destroy New Haven. Hopefully you now have a good feel for how Shadowrift works. You can check out the official Shadowrift 2nd Edition rulebook at BGG if you want a more detailed explanation of the rules. The Town deck building mechanic is awesome. I believe this is the first game we’ve played that has players build personal and public decks. It works brilliantly. We also like that there are six different monster factions. Each one plays out quite differently than the others, making it so you have to change strategies based on who you’re facing. It also gives the game a huge amount of replay value. There’s more cooperation in Shadowrift than any other deck building game we’ve played. There are a ton of cards that allow you to help other players or work with them to take down monsters. If you want to win, you need to talk about every move with your teammates. It’s really impressive how the game ramps up in difficulty as you go. You have some time in the beginning to get a few key cards in the decks, but you know the monsters are going to come flying at you soon enough. It builds a great amount of tension and we’ve liked the difficulty level at each player count we’ve tested out. It’s nice that the designer built in a way to spread Heroism out evenly. It’s the most powerful resource card in the game, so it’s nice that everyone gets some regardless of how often they kill monsters. Constantly having to shuffle decks and move cards around can sometimes take you out of the experience. Quarterbacking can be a problem with some groups. Since most of the time you want the other players to know what you have in your hand, people who like to take over and tell others what to do could have a field day with this one. Games can run a bit long at higher player counts. If you’re really into the experience, though, who cares?! 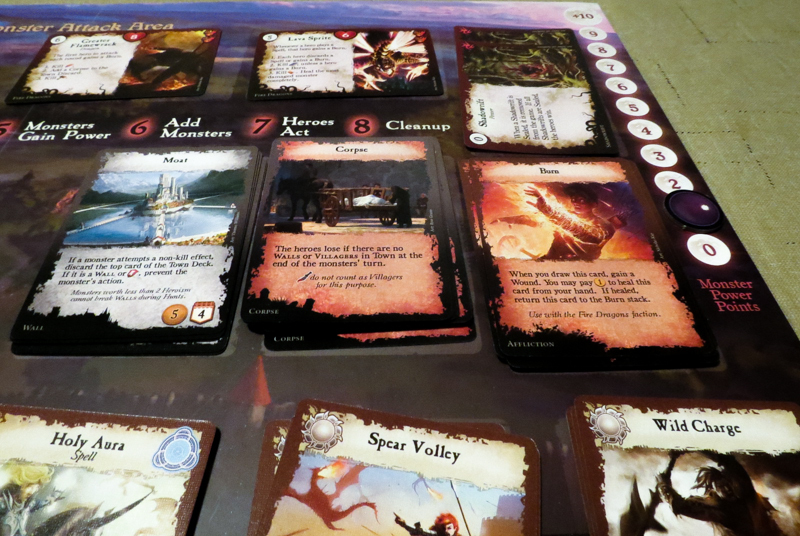 Fiddliness aside, Shadowrift is one of the better deck building games that my group has played. I’m not sure yet if it’s going to make it onto our Top 5 Deck Building Games list, but it’s definitely a game that most people will want to check out. You’ll want to buy Shadowrift 2nd Edition if you like fantasy games, co-op deck builders, and/or want to try out a cooperative game that introduces a couple unique mechanisms. In my group’s collective opinion, Shadowrift is a keeper! UPDATE: Shadowrift did end up making it onto our Best Deck Building Games list! Thanks for taking the time to read our Shadowrift 2nd Edition review!